To see the latest TaylorMade golf clubs, please visit our TaylorMade fairway woods and TaylorMade hybrid pages. Though its RocketBallz series launched a new generation of fairway woods and rescues (hybrid golf clubs), TaylorMade wasn't about to stop there. The RBZ Stage 2 fairway woods and RBZ Stage 2 rescues take some of the best-loved features of their predecessors and make them even better, while introducing new advancements in technology and design. The RBZ Stage 2's face is made from RocketSteel, an ultra-strong material from Carpenter® that makes the face thinner and more flexible. Along with the new face, the clubhead has been redesigned with a lower head profile than that of the original RocketBallz, promoting higher launches and more playability. The RBZ Stage 2's Center of Gravity (CG) has been optimized thanks to two improved technologies: the Speed Pocket and the Thick-Thin Crown. The Speed Pocket, which previously appeared on the original RocketBallz, has a more responsive design for faster flexing. This promotes faster ball speeds and with it, greater distance. For its part, the new Thick-Thin Crown is designed to save more weight that can then be redistributed to place the CG lower and more forward. This more effective CG location enhances ball speed and launch height while lowering spin. To accelerate swing speed, the RBZ Stage 2 comes standard with an ultra-lightweight Matrix RocketFuel graphite shaft. Both the TaylorMade RBZ Stage 2 fairway woods and rescues come in standard and Tour versions. In addition to the features of the standard models, the Tour woods have Loft Sleeve Technology for more optimized performance. Loft Sleeve gives you 7 standard and 5 upright positions that add ± 1.5 degrees to the standard loft. 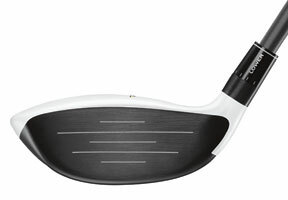 For example, the 3-wood has a loft of 14.5 degrees, but it can be tuned as high as 16 degrees and as low as 13 degrees. Likewise, the rescue 3 has a loft of 18.5 degrees, but it can be adjusted from 21 degrees to 17 degrees. With its matte black clubface and non-glare white crown, the RBZ Stage 2 bears some resemblance to the RocketBallz, but the similarities end there. Instead of bright "slime green" accents, the RBZ Stage 2 features gray and yellow stripes and a new crown decal that makes alignment easier than ever. Like their technology, the clubs retool the visual design of the RocketBallz by refining the coloring and amplifying the functionality. The RBZ Stage 2 fairway wood and rescue provide a mix of improvement and innovation by reworking the RocketBallz clubs and adding fresh features. The result is a club series that's both longer and more playable than the original.